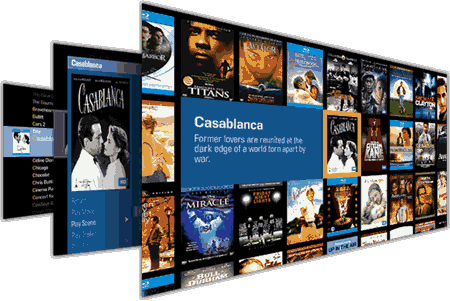 Founded in 2001 and headquartered in Sunnyvale, California, Kaleidescape is pioneering the development of high-end movie servers that redefine how film enthusiasts purchase, organize and enjoy their Blu-ray, DVD and downloaded movie collections. Featuring a breakthrough user interface that gives viewers unprecedented flexibility and control over the movies they watch and the first Blu-ray quality movie download store that matches the audio and video fidelity of Blu-ray discs, the Kaleidescape System brings you a movie experience in your home unlike anything you’ve ever seen. Cinema One is simply the best movie player you can buy. It combines pristine picture quality with high-fidelity sound to transform your living room into the ultimate home theater. Unlike streaming services, Cinema One lets you enjoy all of your movies in true bit-for-bit Blu-ray and DVD quality—whether imported from CD, DVD, or Blu-ray, or downloaded from the Kaleidescape Store. It stores up to 600 DVD or 100 Blu-ray quality movies and automatically catalogs your library in an award-winning user interface. What's more, you can simply download Blu-ray quality movies right from the Kaleidescape Store—the only store that offers movie downloads with the same audio/video fidelity as Blu-ray discs. We make finding and discovering movies simple, fast, and fun. Skim through our engaging Covers View, hover over a particular title, and let the Kaleidescape Movie Guide recommend similar movies you might like. Get a quick synopsis from our Movie Details Page—whether on screen or via our iPad app, where you can see ratings and reviews from Common Sense Media™ and Rotten Tomatoes™. Or sort your collection in a flash via our elegant List View or customizable Collections View. With Kaleidescape you can quickly and confidently find a great film that everyone in your family can enjoy. 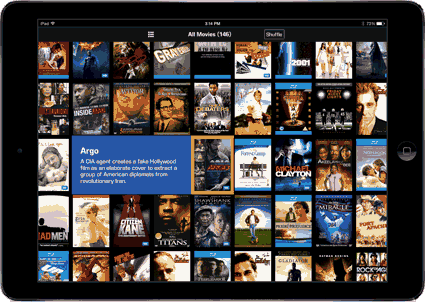 Not only does the Kaleidescape App for iPad make it incredibly easy to find a particular film, it also helps you decide which movie to watch in many different ways. We have brought the power of our signature Covers View to the Kaleidescape App for iPad, giving you the ability to browse through movies and music in a visually stunning way. We've even added Kaleidescape Cover Shuffle, which brings you intelligent recommendations using beautiful animation effects and vivid high-resolution cover art. Just select a movie or album and watch the covers shuffle to display related titles.